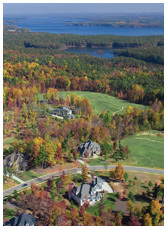 The Legacy at Jordan Lake is a prestigious GATED community in the heart of Chatham County. There are a select number of lots currently available in this stunning community for building a custom home on. The remaining lots were acquired by Meritage Homes (40 lots in Phase one and an additional 52 Lots in Phase two of the community). Meritage homes has a beautiful model home in the community and they offer several floorplans ranging in size from 3,000 - 5,000+ square feet, including one ranch floorplan. Pricing of new homes built by Meritage will range from $380,000 - $500,000+. The community will still have a short irons golf course, beautiful cascading waterfall, miles of trails, crystal-clear streams, rolling carpet-like meadows, and panoramic tree-lined ridges. Homesites are available for your custom dream home or you may choose to build with Meritage Homes on one of their newly acquired lots. For more information regarding the floorplans and options available, please email or call me, Yvonne Beal, at 919-599-9500. Nestled near Jordan Lake within 640-rolling acres .